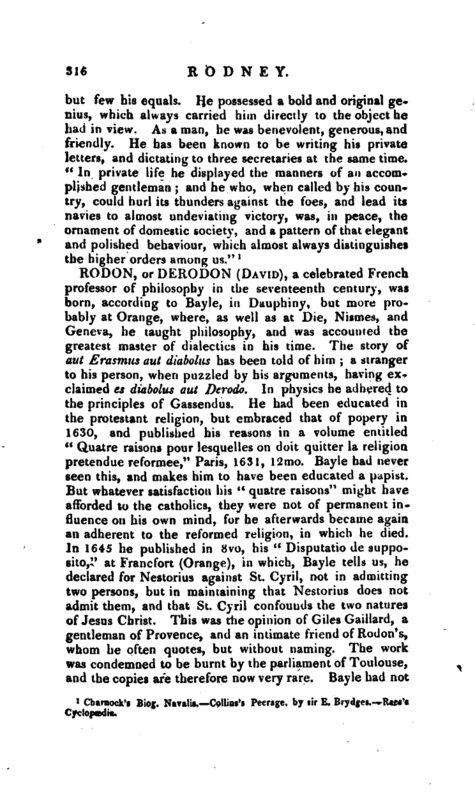 , a celebrated French professor of philosophy in the seventeenth century, was born, according to Bayle, in Duuphiny, but more probably at Orange, where, as well as at Die, Nismes, and Geneva, he taught philosophy, and was accounted the greatest master of dialectics in his time. The story of aut Erasmus aut diabolus has been told of him; a stranger to his person, when puzzled by his arguments, having exclaimed es diabolus aut Dtrodo. In physics he adhered to the principles of Gassendus. He had been educated in the protestant religion, but embraced that of popery in 1630, and published his reasons in a volume entitled “Quatre raisons pour lesquelles on doit quitter la religion pretendue reformee,” Paris, 1631, 12mo. Bayle had never seen this, and makes him to have been educated a papist. But whatever satisfaction his “quatre raisons” might have afforded to the catholics, they were not of permanent influence on his own mind, for he afterwards became again an adherent to the reformed religion, in which he died. In 1645 he published in 8vo, his “Disputatio de supposito,” at Francfort (Orange), in which, Bayle tells us, he declared for Nestorius against St. Cyril, not in admitting two persons, but in maintaining that Nestorius does not admit them, and that St. Cyril confounds the two natures of Jesus Christ. This was the opinion of Giles Gaillard, a gentleman of Provence, and an intimate friend of Rodon’s, whom he often quotes, but without naming. The work was condemned to be burnt by the parliament of Toulouse, and the copies are therefore now very rare. Bayle had not | been able to procure one, and is misled by Sorbiere in thinking that Gaillard wrote a book with the same title as Rodon’s. But the work of Rodon which made the most noise was his “Tombeau de la Messe,” or downfall of the mass, published at Geneva in 1654, 8vo, 1662, Amst. 1682. For this he was banished from France, by an arret of Jan. 29, 1663, on which he took refuge in Geneva, where he died in 1664. Saurin, who saw him in that city about the time of his death, says he appeared to him to be perfectly orthodox. 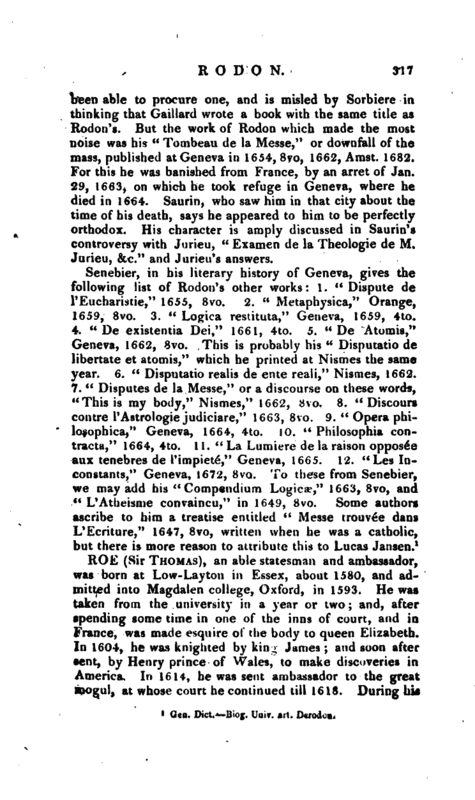 His character is amply discussed in Saurin’s controversy with Jurieu, “Examen de la Theologie de M. Jurieu, &c.” and Jurieu’s answers. Gen. Dict.—Biog. Univ. art. Derodon.